Jet and Producer Andy previewed the show now in it’s 11th month on AM 830 KLAA. Thanks to all of our loyal listeners for your support! We love your positive feedback. On August 24th we’ll be broadcasting from the new Bristol Farms store at 3105 Wilshire Blvd. in Santa Monica from 10:00 a.m. until 12 Noon. 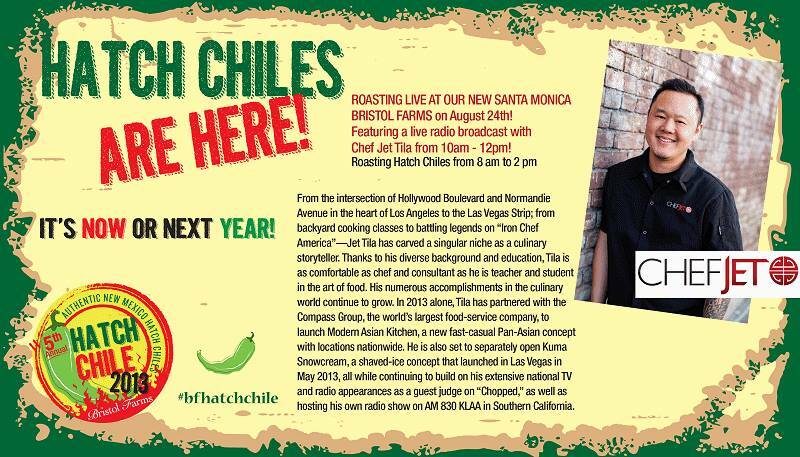 Melissa’s will be there roasting Hatch Chiles. They will also be sampling the best creations from the Melissa’s Hatch Chile Cookbook. Bristol Farms will also be sampling their propriety Hatch Chile creations from Bristol Kitchens in the store. Producer Andy’s pick of the week is Marche Moderne’s Annual Bouillabaisse Week on now nightly until July 18th. All of the fish used in this iconic seafood stew from Provence is flown in from the South of France under the watchful eye of Chef / Proprietor Florent Mareneau. He is one of the most accomplished French chefs cooking in the West. There are special aperitifs and French Rose selections available to compliment the meal. Reservations suggested at 714.434.7900 or go to Marche’s Moderne’s website. Jet is frequently asked for a solid recommendation for Northern Thai food. As it happens his Mother, Mary, is from that area. Jet suggests The Spicy BBQ Restaurant in the Little Armenia neighborhood of East Hollywood. It’s a small place (15 seats) so reservations are advised. They do not have a beer and wine license so it BYOB. Like most family-owned Thai restaurants it’s cash only. Two standout dishes are khao soi and Northern-style larb.